Thursday, July 19th, 2018, 5:30 p.m. Selected by Outside Magazine as one the Best Books for Spring 2018! Sandy Stott, the "Accidents" editor at the journal of the Appalachian Mountain Club, delivers both a history and a celebration of the search and rescue workers who save countless lives in the White Mountains--along with a plea for us not to take their steadfastness and bravery for granted, as she presents Critical Hours: Search and Rescue in the White Mountains. A misread map, a sudden storm, a forgotten headlamp--and suddenly a leisurely hike turns into a treacherous endeavor. In the past decade, inexpensive but sophisticated navigation devices and mobile phones have led to alarming levels of overconfidence on the trail. Adding to this worrisome trend, the increasing popularity of ventures into mountainous terrain has led hikers seeking solitude--or an adrenaline rush--into increasingly remote or risky forays. 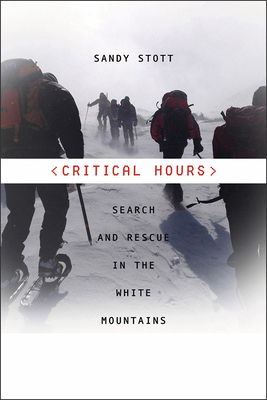 Filled with tales of astonishing courage and sobering tragedy, Critical Hours will appeal to outdoor enthusiasts and armchair adventurers alike. A misread map, a sudden storm, a forgotten headlamp—and suddenly a leisurely hike turns into a treacherous endeavor. In the past decade, inexpensive but sophisticated navigation devices and mobile phones have led to alarming levels of overconfidence on the trail.